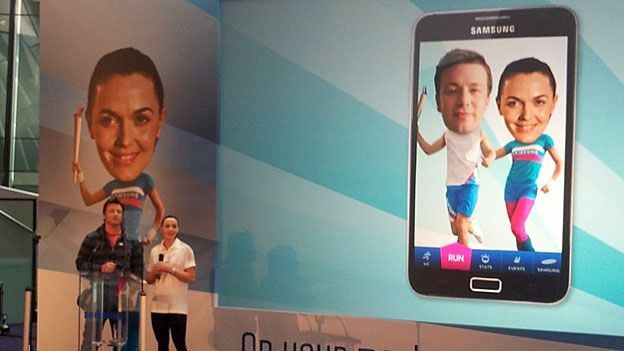 Samsung challenges the UK to get moving and pledges to donate £1 to charity for every mile covered using their new sports tracking Hope Relay app in the lead up to London 2012. Celebrity chef Jamie Oliver joined Great Britain Olympic hopeful Victoria Pendleton and David Beckham today to launch the Samsung Hope Relay, a new charity sports initiative that sees the Korean tech giants pledge £1 for every mile clocked up by the public in the build up to the London 2012 Olympics. The Samsung Hope Relay gives everyone in the UK the chance to download a GPS-powered app that tracks any mile run, walked, cycled or even skateboarded. Samsung has pledged to donate £1 to childrens' charity Kids Company for every complete mile, for any activity, provided it's under the 25mph speed limit. The app works like any other GPS-tracking tool such as Endomondo or RunKeeper but features some clever social additions. Users can create their own avatar by snapping a head shot and attaching it to one of several athletic frames and lycra-clad frames. Participants are also given the option to share runs on Facebook, form teams to compete or even track how their town is doing against others in the UK. For each individual, the app displays key stats including how many miles you've clocked, how much money you've raised and how well you're doing against everyone else in the Hope Relay. Top performers could even see their avatar mugshot plastered over the Samsung tour bus that will be following the Olympic Torch relay around the UK. Andy Griffiths, Managing Director Samsung UK and Ireland added: "We're encouraging everyone to get involved. The more the better as far as we're concerned." Griffiths went on to say he hoped that through this app they will be able to easily reach the £1m target that can potentially be awarded. The Samsung Hope Relay runs between now and 12 Aug 2012. The free app can be downloaded from the Google Play store, Apple app store or by sending a free text to 61116 and following the link.